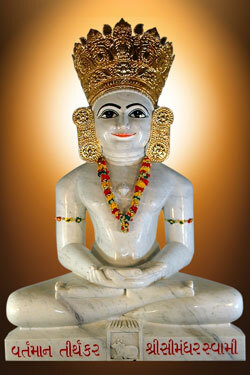 Simandhar Swami Janma Kalyanak will be celebrated on Sunday, April 28th. with Snatra Puja and Ashtha Prakari Puja of Shri Simandhar Swami followed by Swamivatsalya. Gheeboli will be performed for the Ashtha Prakari Puja, Aarti and Mangal Divo. Shanti Kalash will be done by the main sponsor. You can participate in Snatra Pooja with a sponsorship of $101. JSMC Thanks Dr. Chandrakant & Devyani Shah family for main sponsorship. To participate in Snatra Pooja or for more information please contact Religious Secretary OR Treasurer.